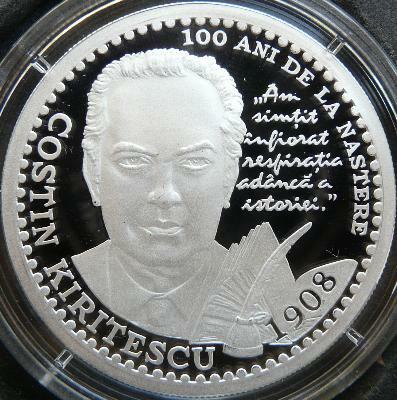 This coin was dedicated to the 100th anniversary of the birth of Romanian economist Costin C. Kiriţescu. 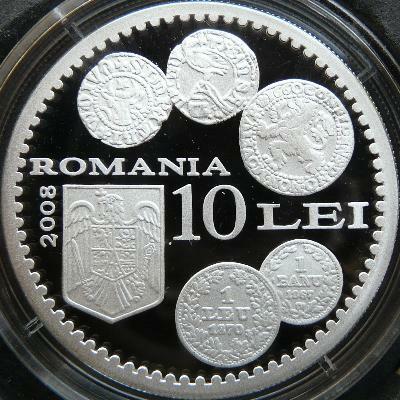 The 10 lei 2008 coin pictures above are present on the site through the permission of an anonymous donor. Costin Kiriţescu was the son of Constantin Kiriţescu, author of the monumental historical work "Istoria războiului pentru întregirea României 1916 - 1919" (History of the War for Romania's Completion 1916 - 1919). The economist Costin Kiriţescu studied at Bucharest. He obtained his Ph.D. title in Germany. In 1992 he was elected member of the Romanian Academy. He worked for many years at the National Bank, and after 1989 he was member in the Administrative Council of NBR. He worked also as a university professor. Costin Kiriţescu has written many scientific papers. For the numismatists his best known work is "Sistemul bănesc al leului şi precursorii lui" (Pecuniary System of Leu and its Precursors), published in three volumes between 1964 and 1970.